Being creative is one of the best ways to express your own unique artfulness to everyone around you. Here at Sew What? Inc., we love that our clients are super creative and allow us to be a part of their creative process! 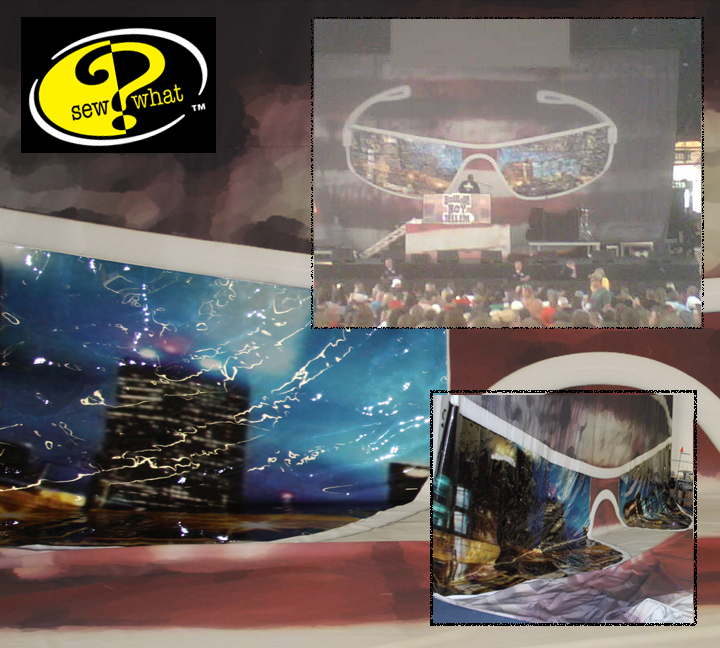 A fantastic way to construct something truly one-of-a-kind for your production, concert tour, or trade show is to have us custom-build a mixed media piece that comes directly from your own original vision. Throughout the years, our manufacturing department has worked on many custom Mixed Media pieces for clients, who wanted us to build them something they can profile on their stages that had never been seen before. It can be painstaking work–lots of fine details, exact measurements, precise stitching, and, of course, it all needs to look fantastic, too—but we relish the challenge! Mixing different fabrics, colors, substrates, and styles helps create a design that gives the drapes texture, depth, and drama where there might not have been before. 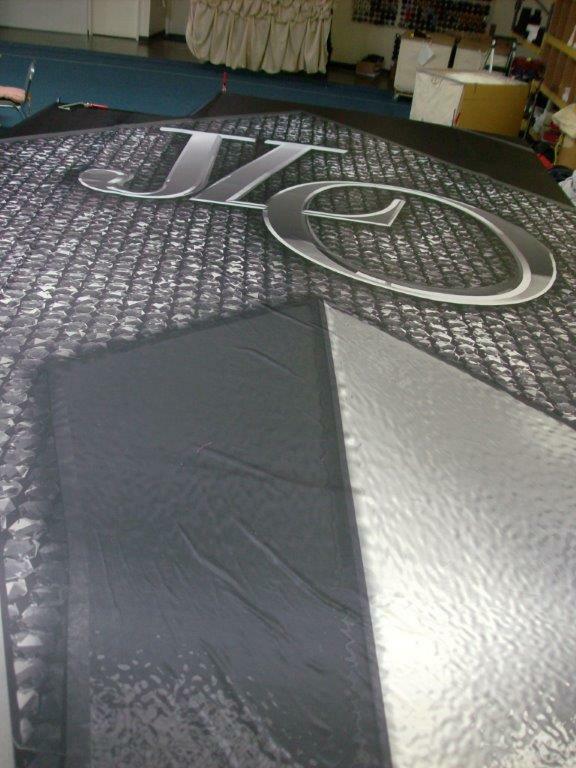 Layering Metal Mesh on top of Muslin or Textura on top of Encore, using UV paint to really help your backdrop glow, or bedazzling a cotton drape with loads of beading and sparkly applique, all help to give the drapes a rare look that is not commonly seen. 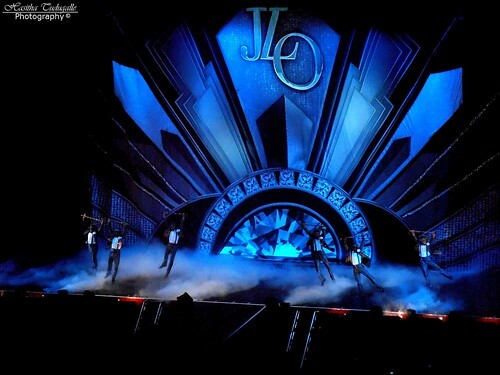 We’ve recognized in the past how successful mixed media pieces have been for many of our clients’ stage designs, and it’s always thrilling when we get to continue to do what we love—innovate this industry with exclusive custom-built pieces so our clients can dazzle their audiences again and again! Solenoids are often used for a traditional Kabuki Drop, in which a backdrop is hung on the solenoids and then, with the push of a button, drops from the sky or drops to the ground. But did you know that you can also use the same system in a variety of non-traditional ways? 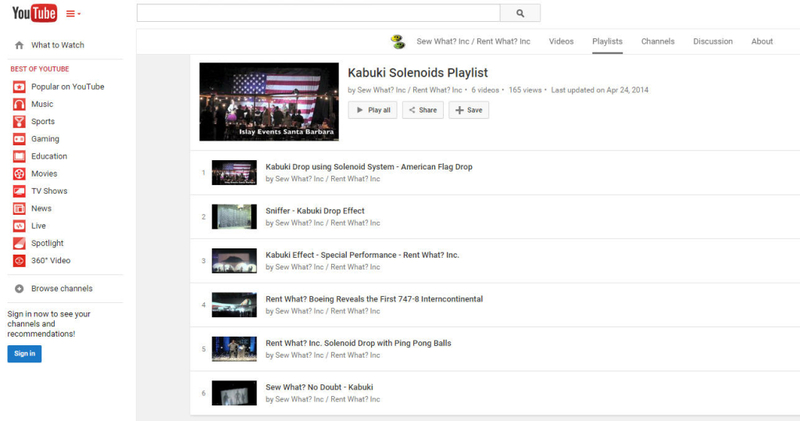 Our Kabuki Solenoids Playlist on YouTube features videos which highlight a variety of ways that our customer have used kabuki drop systems in innovative ways, from dropping ping pong balls to combiningg with a sniffer tube system to reveal a new jumbo jet, and much more. So head on over to You Tube and check out the playlist! 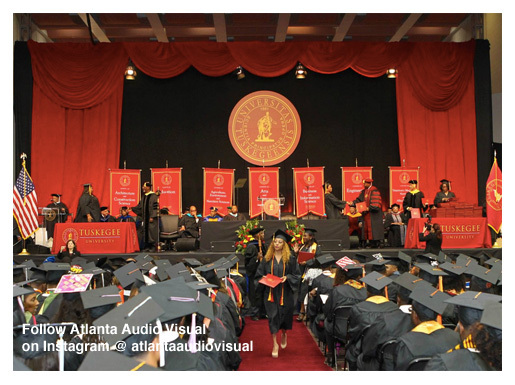 We love being a part of special events all over the globe, but especially love helping create a unique and memorable atmosphere for the many graduation ceremonies occurring each week around this country. A very popular choice for our clients is to rent or buy Pipe and Base drape and hardware from us to match the color scheme of the school that’s having the ceremony. With an extensive amount of colors, sizes and styles to choose from, we love being able to help take the guesswork out of this event for the producers involved, and offer some easy-to-install, out of the bag, ready to go drape and hardware that can be set up practically anywhere imaginable. 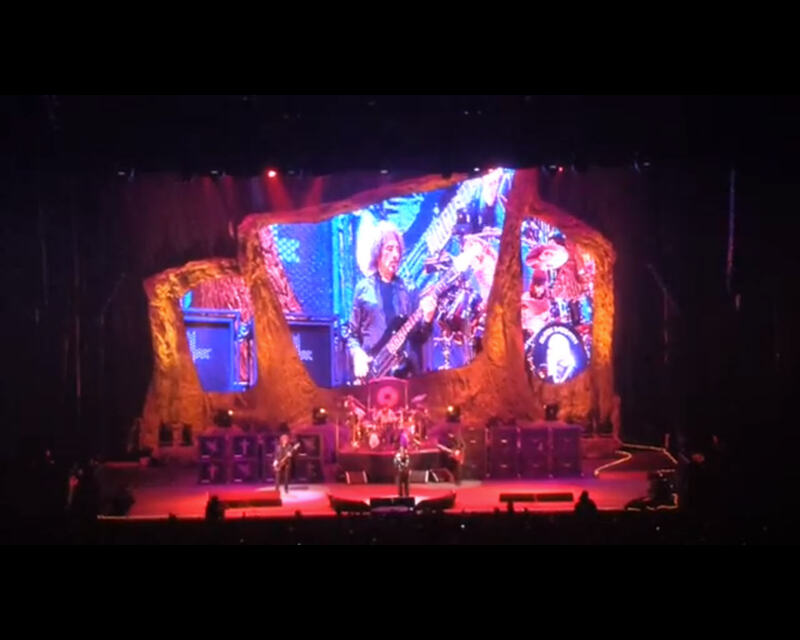 However, we get really excited when our clients have the space, time, and ability to think “outside the box” on this type of stage design, and go with something a little more decadent. 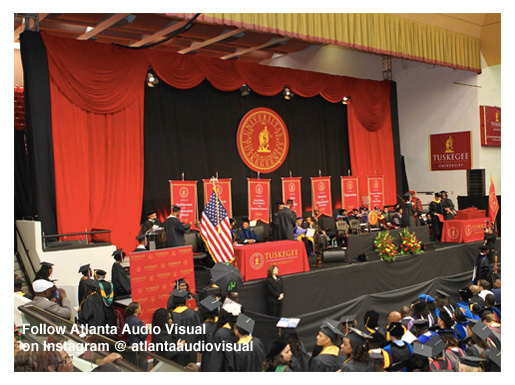 Recently we had the pleasure of working with production designer Brad McWhorter and the creative team at Atlanta Audio Visual, who were responsible for the beautiful stage design at this year’s graduation ceremony at Tuskegee University. 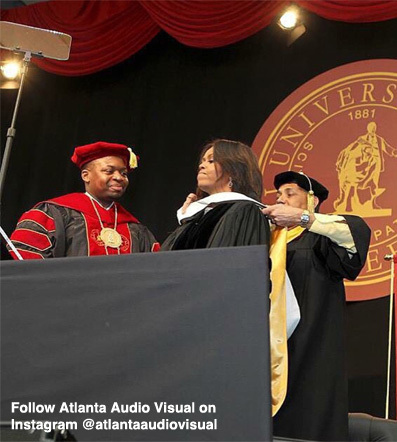 Looking to match the colors of the school, he went with some of our rich, velvety Red Super-Vel draperies from our Rockin’ Red Drapery Collection. At this location, he had the space and functionality to use some of our taller rental 23’h x 10’w Red Super-Vel pleated drapery legs, but he also wanted something unique to help create a “WOW” factor. 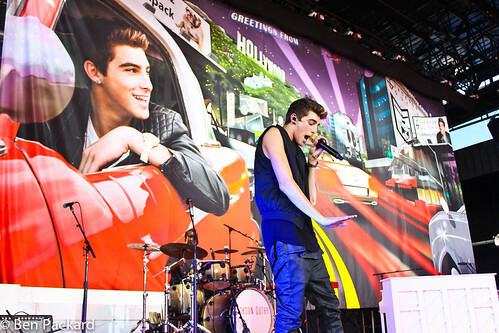 He decided to frame the stage with our beautiful and versatile rental 60’w Red Super-Vel Swagged Border, adding some extra drama to this exciting event. Some black masking drapery as the backdrop really helped the school color pop, drawing the eyes to the stage but not detracting attention from the students, speakers and special guests. We were thrilled to help Brad and his creative team make this event a huge success, and love to help our clients think outside the box on their stage designs whenever possible. Whether it be traditional pipe and drape, masking drapes, or some of our unique specialty draperies, let us help you to create the stage design you are envisioning for your next special event! Need a temporary wall divider, an exhibit booth, or a way to change the look of a bland event space? Thought about using pipe and drape components, but wondering if it makes sense to purchase for a one-time short-term use? 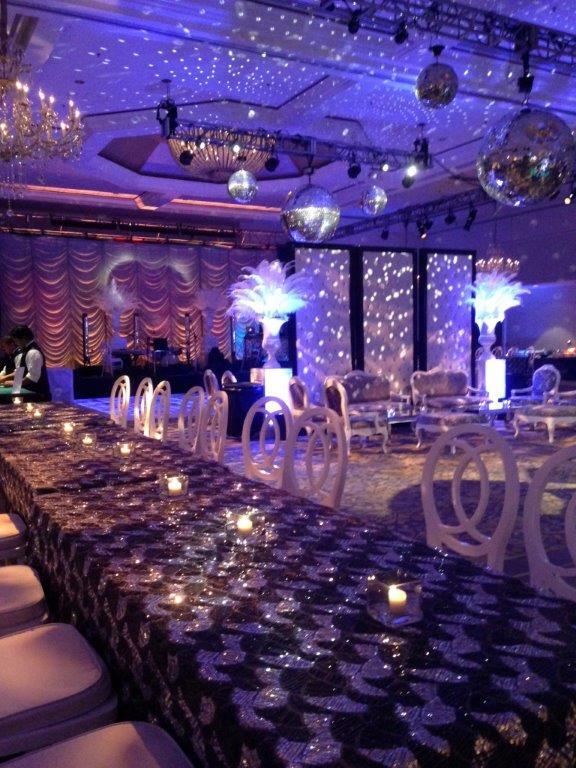 Plan on using pipe and drape for multiple events, but want flexibility in size and style? If you answered “Yes” to any of these questions, a pipe and drape rental may be right for you. With a wide variety of adjustable uprights, bases, and telescopic drape supports available for rental, nearly any size and configuration of pipe and drape can be accommodated. Whether you need just a few pieces of hardware, to hang a single 8’ h x 10’ w backdrop, or enough hardware and drapery to create dozens of exhibit booths, renting is not only an affordable option, but saves you the headache of storing the hardware after the event is over. One benefit to renting pipe and base drapery is that renting allows you to achieve a different look for each show or event without investing in several different sets of drapes. From simple flat panels in a variety of colors, to gorgeous swags or Austrian style curtains, rental drapes (made to be compatible with pipe and base hardware) can be an important part of your event decor. If you will be using pipe and drape for multiple events, or if you have a very specific design in mind, why not combine rental items with purchased pieces? If the configuration will not change from one event to the next, consider purchasing the hardware (for multiple uses) but renting the drapery, which will allow you to choose different drapery for each event. Want a completely custom look? Consider purchasing the drapery (perhaps a digitally printed backdrop, a theatrical-style pleated drape, or a non-operable Austrian), but use rented hardware to hang your custom piece. This allows you to choose the exact fabric, color and style of drape, but still maximize your décor and design budget. Want to learn more about our rental options for pipe and base hardware and drapery? We would be happy to help – you can contact us online or by phone at 310-639-6000. 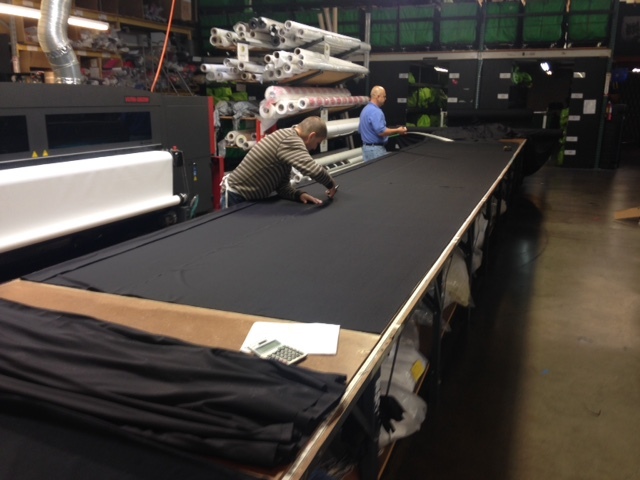 Did you know that we custom cut our fabric for every single item that is sewn in our sewing room? 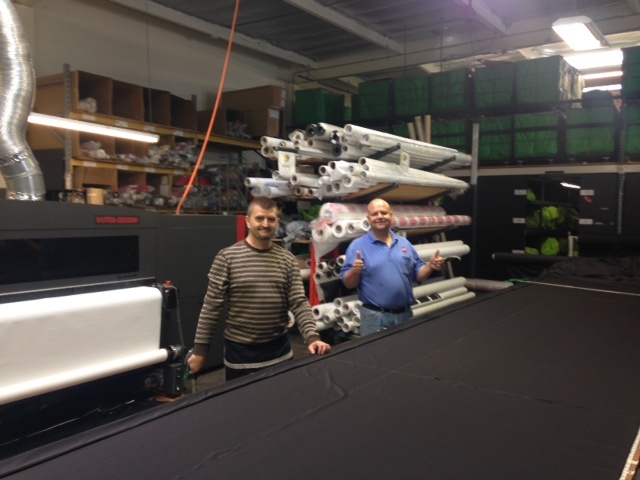 Jorge and his assistant (today it is Sal) cut fabric of all styles, all weights, all textures, and all colors throughout the entire day, making sure each piece is cut to the exact length that the sewing staff needs in order to start creating our client’s custom stage curtains, backdrops and other soft goods. 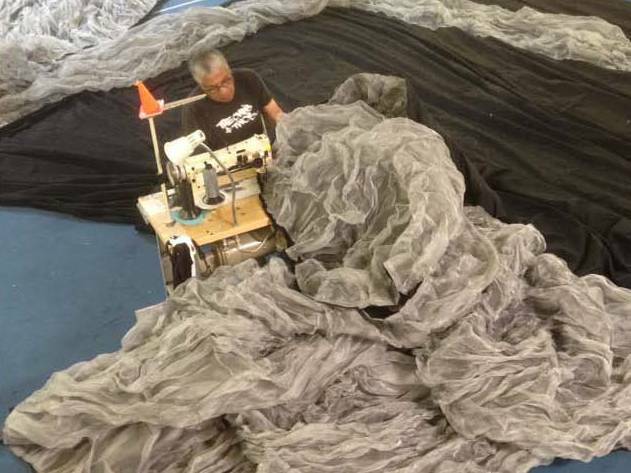 In his tool belt, Jorge has his scissors, chalk and measuring tape—all crucial items that he uses regularly, and the cutting table is permanently marked along each edge with a ruler along the entire length. It is very important that the cuts are completely accurate, so that the sewing team gets the fabric pieces that they will need to do their job as accurately as possible, too. This is also where our QC (Quality Control) process begins–Jorge and his team inspect the fabric for any possible flaws, as we need to be extremely careful that the fabrics that are coming in from fabric mills all over the country haven’t had any issues with their dye lots, color saturations, or possible damages that might have occurred while in transit. He then communicates with the sales representative and our purchasing manager for any replacement fabrics that might be needed, down to the linear yard. So you see, it’s not all just cutting fabric!